Part of the show Can Science Prove Whodunnit? Graham - There was a case called "The Phantom of Heilbronn." This was a serial killer that German police and European police searched for for many, many years and believed to be the world's first transgender serial killer. This person was linked to murders, to robberies, to car crime, to thefts, so, was a very odd serial offender. But all the eyewitness testimony said that the person was a man but all the DNA evidence was from a woman, and rather than question the DNA analysis, the police believed this must be a transgender serial killer. It turned out that a woman who worked in the factory that manufactured the tubes, or the swabs, or whatever they are, wasn't doing her job properly and contaminated every single device that she constructed, so it was her DNA that was being recovered from these crime scenes across Europe. But, rather than question DNA analysis, the police invented the world's first transgender serial killer who was roaming Europe committing all of these crimes. Graihagh - Wow! That's quite a story. Really, if you want to know what actually took place in a crime, you need an eyewitness or the victim themselves to tell you what happened. Graihagh - And this, I suppose, involves a lineup so walk me through what we happens when you catch the suspect? Graham - Once they've got a suspect, one of the things they do is to show that person to the eyewitnesses and victims that were involved in the crime to see whether those people can recognise them. What we need is something like a lineup. We need the suspect themselves and people that look like them - we then need to show that to the witness. Now that means that the witness, the suspect, at least eight people that look like them, legal representation, as well as police and personnel, all have to be together in the same place at the same time. Graihagh - A logistical nightmare that can, actually, delay this process by up to six weeks. And, I suppose, we all know that it's much harder to remember something from six weeks ago than it was yesterday but, that's not just all. Stress can really affect your memory too. Picture this - you were held at gunpoint during a robbery. Imagine how stressful that is in the first place. Now you have to go in, confront them, identify them in the flesh. Georgia - Absolutely the last thing I would want to be doing; but, isn't some stress quite good for your memory? Graihagh - Yes, you're absolutely right. A little bit of stress, perhaps before your exam, can be really good for your cognition but lots of stress - not good at all! Graham - But a lot of stress, such as a victim of a crime might experience, has a very deleterious effect indeed on cognitive performance. Graihagh - Does that mean there's lots of mistaken identities and, in effect wrongful convictions? And, if so how many? Graham - Working out the incidence of miscarriages of justice is very difficult indeed because, of course, you need to know what happened in the original crime. If a very long, drawn out investigation and court trial wasn't able to establish that, then how is a researcher going to? 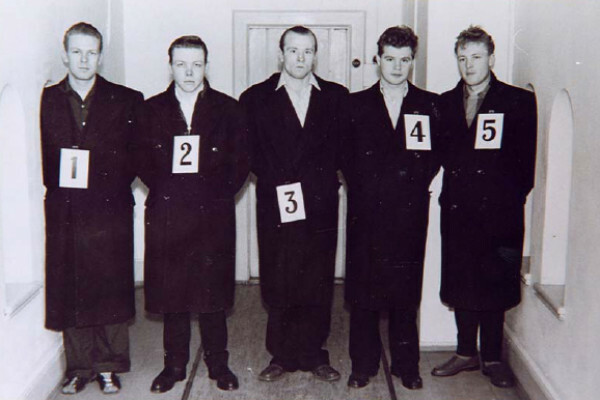 Researchers looking at this estimate that something in the order of a quarter to a third of all identifications made by an eyewitness are identifying somebody who is innocent. Now that, of course, doesn't mean that person then goes onto be convicted. There are checks and balances, there's the court procedure as well. In the United States, there's an organisation called the Innocence Project that investigate cold cases from many years ago in which physical samples were kept, but DNA analysis wasn't used in the original investigation. So far, they've overturned more than 300 cases of wrongful conviction. Some of those people were on death row. The average sentence served by those people was more than 13 years. Graihagh - I mean, that seems very high and the fact that they were on death row frightens the pants off of me. Graham - It's a very scary statistic. I would place a great deal of money indeed, that at least one person has been executed in the US who was innocent of the crime they committed. It could be many more. But it's undoubtedly the case that many people have served significant decades of their life in prison for crimes they didn't commit. Graihagh - I mean that estimation alone makes me think something needs to be done. So, in an ideal situation, when it comes to eyewitness testimony, at least, we need a solution that gets rid of logistical nightmare stuff making it quick so that witnesses have a better chance of identifying a suspect and that's also stress free. Plus, the lineup needs to be conducted by an officer who doesn't know the identity of the suspect. Graham - That's because the person can give off quite subtle non-verbal communication that cues the witness into who it is. Graihagh - And then witnesses having identified someone often report looking at the officer to see if they got it right. Cue the non-verbal cue. Georgia - Oh I see. Sounds like there's lots to think about her? Graham - Rather than a police officer wandering around the local shopping mall trying to find eight people that look like the suspect, we can look through thousands and thousands of faces. That means that the people who appear in the parade will look more like the suspect and the parade will be fairer. Another significant advantage is video identification parade systems are perceived by witnesses as being less stressful. Graihagh - This video identification parade - it sounds like it overcomes a lot of those problems but, I wonder, can we ever really be sure what we thought we saw. Graham - I don't think it's possible to imagine a technology that could be developed, no matter how sophisticated, that could ever overcome the fundamental problems with human cognition. We kind of have this perception that when we're seeing something, we see everything that goes on around us, the world is exactly as we see it, and that we remember it almost like a video tape. Our memories are not like a memory of a computer. We interpret the world around us to make sense of it and so we remember things according to who we are and the expectations we have about how certain situations should play out. So, technology can assist in limiting those errors, but technology will never be able to overcome the fundamental frailty of human cognition. Georgia - Hold on - that sounds like it's quite dramatically unreliable then and I know Graihagh mentioned earlier that forensic science can lead you on this complete wild goose chase. But the figures he said earlier about all those wrongful convictions are quite shocking to me and it sounds like DNA is actually what cleared their names in the end, but now he's saying that an eyewitness might be remembering something completely differently to what happened. Georgia - Is it rear view mirror? Graihagh - The rear view mirror - yep. And you feel like you've got enough field of vision to drive safely but you've still got a blind spot. I think that's the point Graham's trying to make. Use as many bits of kit as you possibly can to make it as fair as possible but, also, that there are blind spots and mistakes. Georgia - I guess we just have to be aware that our brains aren't quite as clever as we thought they were. Graihagh - Yes. I mean I think people often think, myself included, my eyes are like cameras and my brain is like this computer and everything I see is the truth, basically. But, actually, our pictures have filters and when you're stressed the brain can do all sorts of funny things to those pictures. So yeah, the brain is just phenomenally complex and we're only just really starting to understand some of the most basic, fundamental functions of the brain, yet alone some of the more really complex things we've been talking about today like stress, memory, and forgetting. Next How does DNA profiling work? Exercise and Interaction for the Brain?